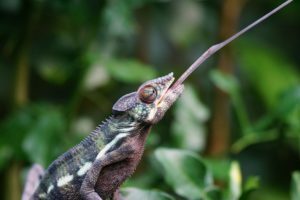 Choosing the best cage for a crested gecko can be a bit of a challenge. There are so many types and sizes available it can be hard to narrow down your options. 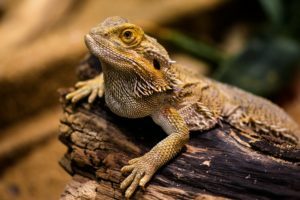 In this guide, we’ll go over the best crested gecko vivariums and cages currently on the market. If you’re just interested in our top pick, then we recommend the Exo Terra Rainforest Habitat Kit (Buy Online). The Exo Terra Rainforest Habitat Kit (Buy Online) is one of the best all-around crested gecko cages on the market. The Exo Terra Rainforest Habitat Kit measures 18” x 18” x 24”, and it weighs 43.9 pounds. This tall all glass terrarium is perfect for a crested gecko since it offers lots of vertical space for them to explore. It also has two large glass doors that will allow you to easily reach inside to do maintenance or to take your gecko out of the cage. This vivarium also has a waterproof and leakproof base, so any condensation that builds up won’t leak out of the cage. The Exo Terra Rainforest Kit also comes on a raised stand, so you can easily slide an under tank heater beneath the base. This is a nice feature to have if you live in a cooler climate since it will allow you to keep the temperature of your crested gecko’s habitat stable throughout the year. The Exo Terra Rainforest Habitat Kit offers excellent ventilation since it comes with a stainless steel mesh lid, and it also has large vent holes underneath the front doors. The large vent holes will allow air to circulate through the whole terrarium and out the lid. This will help prevent stagnant air pockets from building up, and it will help prevent mold from growing inside your geckos living space. This terrarium kit also comes with a built-in 3D jungle themed background. This insert will really help tie together any plants and décor you add to the cage. It also has space behind it so you can keep any cables or other support equipment hidden and out of the way. If your looking for a crested gecko enclosure that offers the best value for the dollar, then the Exo Terra Rainforest Habitat kit is a great choice. It’s also the best crested gecko cage for anyone who wants to have a large terrarium that won’t take up a lot of floor space. The Zilla Vertical Tropical Kit (Buy Online) is a great choice if you’re looking for a crested gecko complete setup that comes with everything you need. This crested gecko cage measure 12”x 12” x 18”, and it weighs 16.7 pounds. That makes it the perfect fit for a kids room, or on a desk or any other tight space. This kit comes with almost all of the basics you will need to set up a crested gecko habitat right in the box. First, and most importantly it comes with a heat lamp fixture, and a 25 watt Mini halogen bulb. There is also a temperature and humidity gauge included in the box, which is a nice little addition to have in any gecko cage. It also comes with a small feeding dish so you can keep your geckos food from spoiling the included substrate. 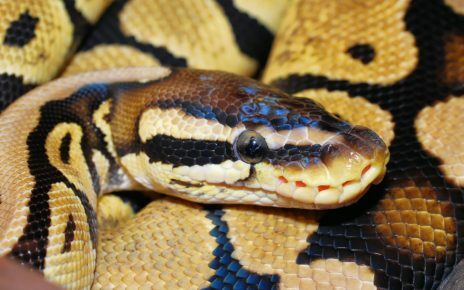 The only thing you might want to add is a UVB light since you won’t be getting one with this cage. The Zilla Vertical Tropical Kit has a single locking front door that will allow you to easily clean and maintain every corner of the cage. It also has a watertight lower section, so it won’t leak if any water pools up in the base. This crested gecko habitat also comes with a removable metal mesh screen lid and a ventilation grate on the front of the frame. The Zilla Vertical Tropical Kit also comes with a 3D textured background that will give your gecko a nice surface to climb, and it also makes a great attachment point for any accessories you might want to add to the cage. This crested gecko kit is our number one pick for young children, or for anyone who is new to keeping crested geckos. This terrarium is just the right size to house a single crested gecko, and it comes with a nice set of accessories. It is also very affordable, which means it won’t cost you an arm and a leg to get a gecko habitat up and running. 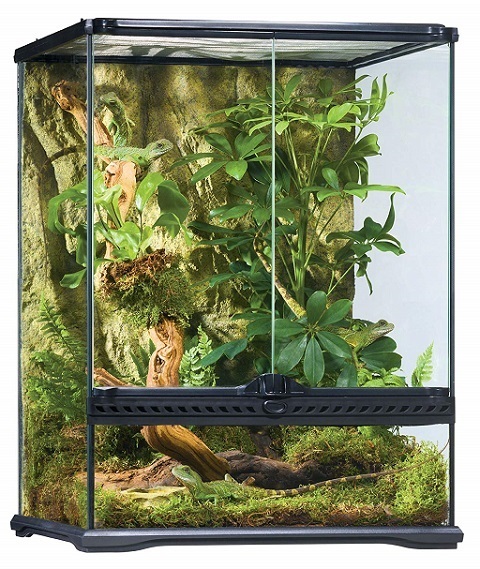 The Exo Terra Allglass 36” Terrarium (Buy Online) is a great habitat if you have multiple crested geckos, or if you just want to provide a single crested gecko with lots of space. This large terrarium measures 36” x 18” x 24”, and it weighs 71 pounds. This crested gecko vivarium is perfect for anyone who wants to make their crested gecko tank a showpiece. You can also get the Exo Terra Terrarium Cabinet (Buy Online) if you want a modern stand that is specifically designed to hold this cage. The cabinet also has a large storage area, so you can keep all of your gecko’s food and accessories neatly stored out of the way. The large 36” Exo Terra Allglass Terrarium has all the same great features as the smaller Exo Terra models found on this page. It offers the same leak proof and waterproof base, which makes it possible to add water features in the lower portion of the tank. It also has two large locking glass doors that will allow you to gain easy access to every corner of this massive crested gecko cage. You can also slip a couple of under tank heaters beneath the raised stand if you want to warm up the substrate. Since this terrarium is so large you can place multiple heaters underneath the tank, which makes it possible to maintain different temperature zones based on your gecko’s needs. This crested gecko cage also has excellent ventilation since it has a large stainless steel mesh lid, and it has large vent holes across the whole front of the cage. There is also a large built-in decorative background that will give your gecko something to climb on throughout the day. The background also has channels to run any cords or misting systems through, so they won’t disrupt the natural look of the cage. If you want one of the biggest and best crested gecko cages on the market, you can’t go wrong with the Exo Terra 36 inch Terrarium if you have space for a large cage. The most unique thing about this terrarium is that it has a custom engineered collapsible design. That means it comes to you in a small low profile package unlike most of the other terrariums you can buy online. Then once it arrives it will only take about five minutes to install with the included guide. The portable design also makes it easy to knock-down if you have to move, or if you want to take your enclosure outside. Even though this crested gecko enclosure is extremely portable it still has durable glass panels on all sides. There are two large glass doors on the front of the cage that have a locking mechanism to keep your gecko safely inside at all times. It also has a large metal mesh lid with safety clips to prevent your gecko from making an escape attempt out of the top. 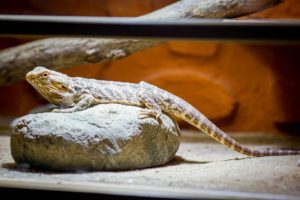 The REPTIZOO Reptile Glass Terrarium also sits on raised legs, so you can put an under tank heater beneath the base to keep the substrate temperature just right. There are also a number of closeable inlet tubes located around this terrarium that can be used to run wires and plumbing into the cage. The Zoo Med ReptiBreeze (Buy Online) is a great cage if you live in a tropical climate that stays warm all the time. This cage measures 16” x 16” x 20”, and it weighs 4.2 pounds. This crested gecko cage uses mesh screen panels on all of the main walls. The mesh walls have their upsides and downsides though. The upsides are that you will have better ventilation and humidity control if you live in a warmer climate. While the downsides are that you will have a harder time keeping the temperature and humidity stable if you live in a cooler area. 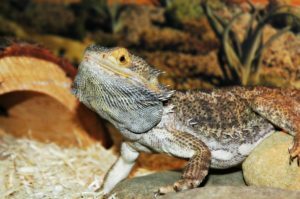 If you live in a region that is always warm and humid, then the Zoo Med ReptiBreeze is actually an excellent choice. This cage will help prevent mold from growing in your gecko’s habitat, and it will keep the cage from becoming too hot. 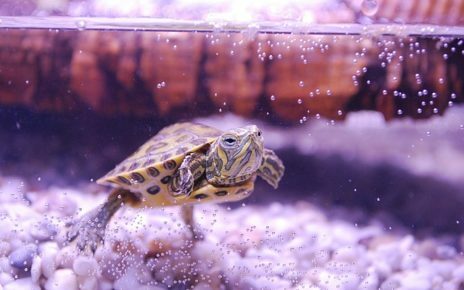 The Zoo Med ReptiBreeze is also very easy to clean since the mesh panels don’t smudge or streak like glass walls. 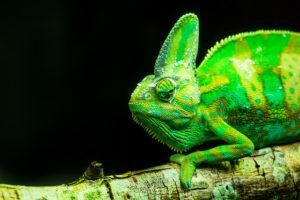 It is also very lightweight, so you can easily travel with it, or you can take it into your backyard in order to give your gecko some time outside. 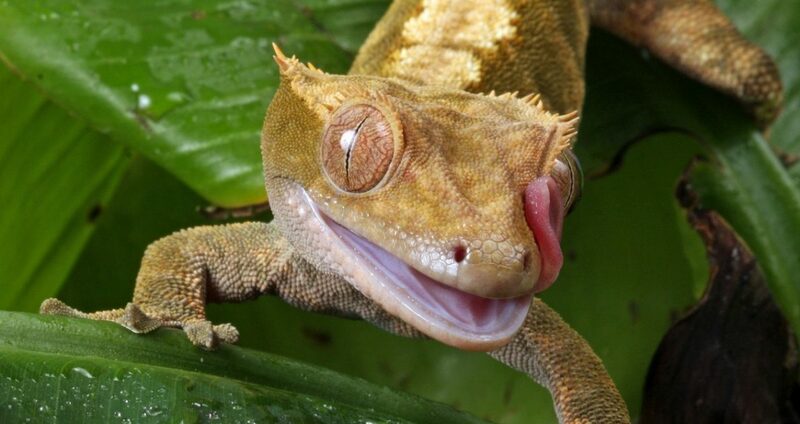 A crested gecko will need a cage that measures at least 12 inches wide, 12 inches deep, and 18 inches tall. A cage this size is really the bare minimum crested gecko cage size, and you should aim to get a larger cage for your crested gecko if it is at all possible. If you want to provide your gecko with enough space to thrive, you should definitely try to get a larger cage. A cage that measures 18” x 18” x 24” is a much better option since it will have more vertical space, which is perfect for a crested gecko since they really love to climb. You also will have more space to add plants and any other accessories, which will allow you to build a little jungle inside. You will need at least a 10-gallon tank to house a single crested gecko. In truth, this is really the bare minimum, and a better option would be to get at least a 20-gallon tank. If you get a 20-gallon tank you should get a 20 gallon high, and not a 20-gallon long. The 20 gallon high will have more vertical space for your gecko to climb. In addition, it will also have a much smaller footprint than a 20-gallon long, which is nice if you don’t have a lot of room in your house to spare. 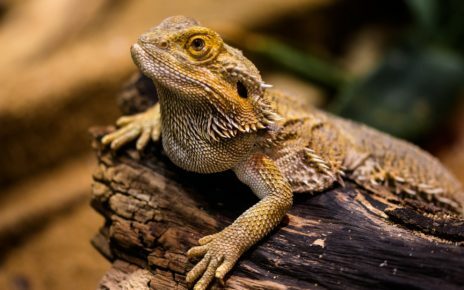 What Temp Should my Bearded Dragon Tank Be?